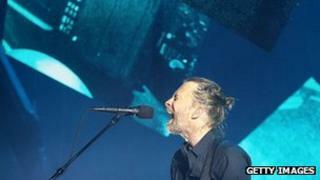 Radiohead lead singer Thom Yorke has pulled some albums from music-streaming service Spotify in protest at how much it pays artists. Yorke has pulled his solo album The Eraser as well as a joint project with producer Nigel Godrich, Atoms for Peace. The singer tweeted that they were "standing up for our fellow musicians" by removing their albums. Spotify said it is "still in the early stages of a long-term project". Radiohead's albums are still available on the site. Yorke tweeted: "Make no mistake new artists you discover on #Spotify will no[t] get paid. Meanwhile shareholders will shortly being rolling in it. Simples." Spotify is the world's most popular music streaming service. Recent figures from the company say it has 24 million active users, of whom six million pay a monthly fee for added features. It said that it had paid $500m (£332m) to rights holders since it was launched in Sweden in 2008 and expected to pay another $500m this year. "We're 100% committed to making Spotify the most artist-friendly music service possible, and are constantly talking to artists and managers about how Spotify can help build their careers," the site told the BBC. Yorke has also removed his music from rival streaming site Rdio. "It's an equation that just doesn't work," Godrich said on Twitter. "The music industry is being taken over by the back door... and if we don't try and make it fair for new music producers and artists... then the art will suffer. "Make no mistake. These are all the same old industry bods trying to get a stranglehold on the delivery system." Godrich, who has produced on every Radiohead album since OK Computer, added: "Plus people are scared to speak up or not take part as they are told they will lose invaluable exposure if they don't play ball. Meanwhile." British electronica artist Four Tet replied with his support: "Exactly. I had everything on my label taken off. Don't want to be part of this crap." There has been much controversy over how much streaming sites like Spotify and Pandora pay artists, which comes as Pandora is pushing to change US laws to lower how much it must pay in royalties to songwriters. The band Pink Floyd recently published an editorial on the issue. "Nearly 90% of the artists who get a cheque for digital play receive less than $5,000 a year. "They cannot afford the 85% pay cut Pandora asked Congress to impose on the music community," Roger Waters, David Gilmour and Nick Mason added. Subscription services are the fastest growing area in digital music, making up 13% of worldwide sales. But 57% of global recorded music sales still come from physical products such as CDs, down from 74% in 2008. As well as Spotify, Rdio and Pandora, services like Xbox Music, Google Play Music All Access and the soon-to-launch iTunes Radio compete for streaming listeners.